Ferrets are fun, cute and interactive animals, often described as perpetual kittens. But to be a responsible owner you should first decide if they really are the right pet for you. Find out if ferrets are legal where you live. Just because the pet store sells them doesn't mean that they are legal to own in your area. They are currently illegal to own in Hawaii, California, and New York City, just to name a few. 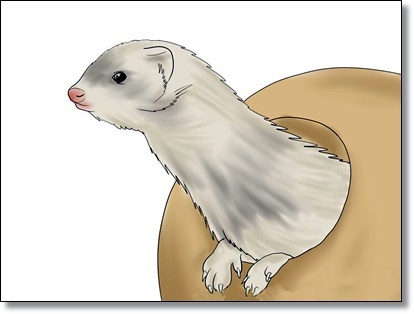 Learn what ferret personalities are like. The word 'ferret' means 'little thief' in Latin. This is an omen to you of things to come. They enjoy selecting household items; not all of which belong to them; and hiding them in bizarre places. It may be your slipper, your keys, your computer mouse, your wallet, or rolled up socks. Giving them their own ferret-safe toys may help but will probably not completely eliminate this behavior. Ferrets are very playful and inquisitive critters when they're awake and need supervision to keep from getting into and/or eating things they shouldn't. 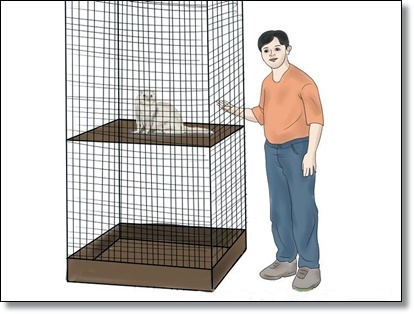 Decide if you will be able to let your ferret out of his cage for at least three hours a day. Ferrets can sleep up to twenty hours a day, but they need to be out of their cage for exercise regularly. They are not like hamsters or gerbils, they're a lot more like little dogs or cats and can become depressed and ill if they don't get out-of-cage time. Decide if you can afford the expense of owning a ferret. Between the cage, accessories, food, treats, toys, litter, etc. your ferret could cost a huge chunk of change. 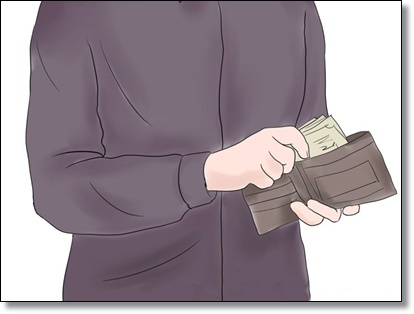 Make a list of all the things you will need to buy and add up the total cost. If all you do is buy a cage, litter, and food you may be surprised with all of the other things you end up needing to keep your ferret happy and healthy. Initial costs of a single ferret can be up to $275. Similar to cats and dogs, they require regular flea treatment, grooming, vaccinations, and a toy or two. Find out if your house or apartment is ferret safe or if you can ferret-proof your home. Ferrets can get into surprising areas. They have insatiable curiosity and will not cease seeking new places to wriggle into. 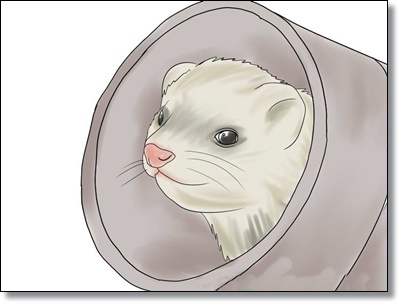 Go on your hands and knees and look for holes in the walls, in the closets, behind your refrigerator, under your cabinets, under your furniture, and anywhere there might be a hidden opening for your ferret to crawl into. The two most common areas are inside the box spring under beds and inside furniture from underneath. Putting a sheet on the bottom of a box spring fixes the bed problem and you can cut a sheet to fit the bottom of furniture and staple it on, or you can take the feet off of furniture so its resting on the ground. If you have a recliner, the safest thing to do is get rid of it. There is no way to ferret proof a recliner and your ferret can get caught in the gears and be squished when someone reclines not knowing he's in there. When you bring your ferret home watch him carefully. He will show you all the places you missed. 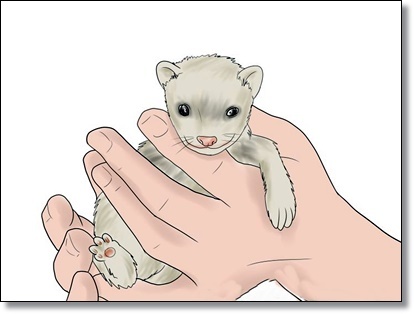 Decide if your current pets and children are compatible with a ferret. 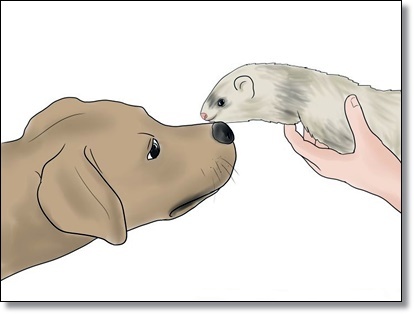 Most dogs and cats will get along well with ferrets. It is like bringing home another small dog or cat to them. If your dog has a high prey instinct, (e.g. chases cats or squirrels) getting a ferret may not be a good idea. Your ferret will not be friends with hamsters, mice, gerbils, rats, rabbits, or any other small rodent. 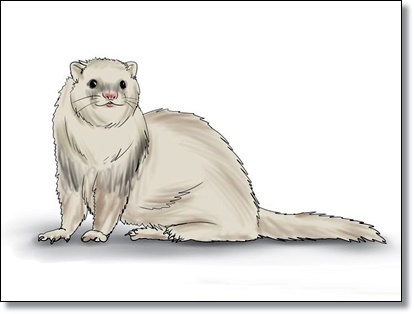 Your ferret will probably see these creatures and think how nice their new owners are for providing a good dinner. Birds and ferrets are also not a good mix and should not be kept in the same house. Children under twelve should always be supervised with a ferret to make sure it is handled properly. Know that ferrets are only 'sort of' litter box trainable. In his cage a ferret will generally only 'go' in one corner. This is where you place his litter box. But ferrets also have a strong instinct to spread their scent over their territory, so they may have 'accidents' in other rooms of the house. Also, if a ferret is busy playing in one area of the house and needs to go, he will likely just shrug his shoulders and go in the nearest corner rather than trekking to his litter box and interrupting his playtime. 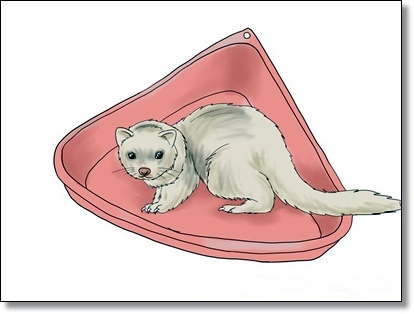 Many ferret owners place multiple litter boxes around their home. Small corner litter boxes can be purchased and placed but realize that to even start to train the ferret it must be watched AT ALL TIMES. Decide if you have the patience to deal with a ferret. Between stealing your socks, underwear, and keys; eating your hamster; needing a litter box in every room and displaying unending energy it's understandable that a ferret owner needs to be endowed with a bit of patience. If you found your ferret in the bathroom shredding every roll of toilet paper you own would you be more likely to say "Aww, how cute! He destroyed my bathroom!" or would you say "DIE FUR BALL!!!" Ferrets are delicate creatures and only live 5 to 10 years. If you buy a ferret, consider it a commitment. And if you aren't prepared for ferret ownership that is not the ferret's fault. Research local ferret rescues and shelters. Consider adopting from a shelter rather than buying from a pet store. Most shelter ferrets are healthy, very loving, and have a head start on potty training. Go to your nearest pet store. In the US, most pet stores are supplied with ferrets from a large-scale breeder in New York called Marshall. 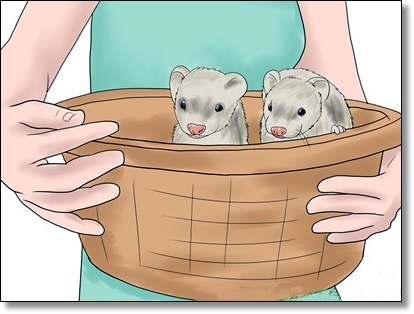 If your pet store does not receive their ferrets from there, inquire who the breeder is. For ferrets from Marshall, there will be a tattoo of two dots on the right ear meaning the ferret is de-scented and fixed. 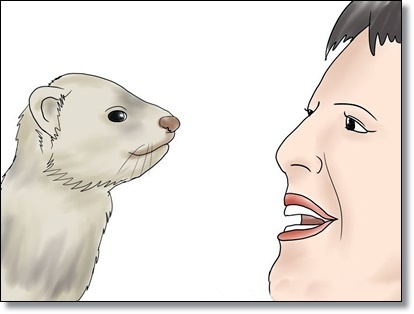 If there is no tattoo, you MUST ask if the ferret is de-scented AND fixed. Unless you are breeding, you NEVER want a whole ferret. Females will die if not bred properly and immediately with care. Males will be EXTREMELY aggressive and smell TERRIBLE. This is not a cat or dog, it MUST be fixed. If the ferret is not fixed and you cannot "afford" to have it fixed, you probably cannot afford to own the ferret. Enjoy your new companion. Average life expectancy of a ferret is 8-11 years (about that of a cat). Always be sure to keep roughly $500 in savings specifically for ferret vet emergencies. 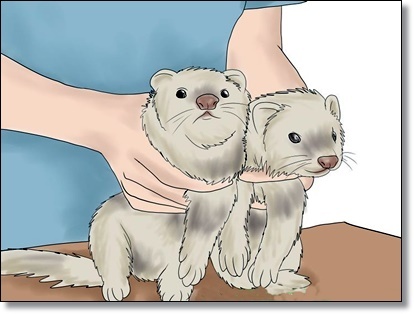 Ferrets as they age can develop malignant tumors that must be treated immediately. They can also develop adrenal gland problems which causes hair loss and eventual death.